Abuna Elia was one of the disciples of the monastic reformer, Abuna Mina el Muttawahad, who rejuvinated monasticism in Egypt in the 1940s and 1950s. Abuna Mina later became the Coptic Patriarch, Pope Kyrillos VI. Abuna Elia was the only one of Abuna Mina's original disciples who didn't become a bishop, an abbot or a pope. He lived for about a decade as a solitary in a cave in the Sahara. Concerned monks of St. Bishoi brought him to their monastery when he was no longer able to care for himself in the harsh Sahara. As the monks were carrying the aged monk into the monastery, Abuna Elia saw the American Benedictine monk and Catholic priest, Mark Gruber, who was staying with the monks to conduct a year-long anthropological study. At the gate of the monastery, the aged monk turned to Fr. Gruber and said, "You are a Roman... You will want to see me; you will want to have some opportunity to talk with me." Fr. Gruber reponded, "Yes, Abuna. I would be very happy to see you." This fateful encounter led to numerous conversations between Abuna Elia and Fr. 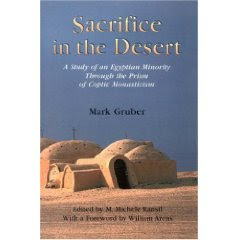 Gruber, and some of Abuna Elia's thoughts are presented in Fr. 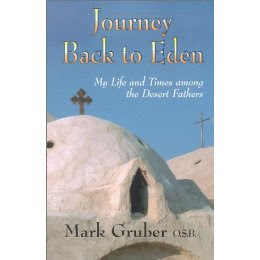 Gruber's books: Journey Back to Eden and Sacrifice in the Desert (both on Orbis Books). In discussing with Fr. Gruber Abuna Elia's understanding of Abraham's relationship to Sarah and Keturah, Fr. Gruber explains, "Abuna Elia was keen on preserving a sense of the unique character of Sarah, the 'princess' whose personality had no peerage for Abraham. The monogamy he bore to her was a reflex of the monotheism to which his faithfulness to Sarah predisposed him. So for Keturah Abuna Elia supplied a commentary of remarkably modern ringing vintage: Keturah was the apical maternal ancestor of a Semitic people 'grandmothered' into Hebrew stock at the time after Joshua. They eventually embraced monotheism and so posthumously Abraham embraced them by the marital reference to her in Genesis. Analogously Abuna Elia observed that the dozen or so ethnic pilgrimage groups in Jerusalem recorded by St. Luke in the Pentecost narrative of the Acts of the Apostles are so included to give a kind of map of Christian missionary expansion when the Acts were written; as if they too were there at the Church’s birthday because they too shared the same Spirit… This is part of the economy of grace whereby Jews today share the Passover Night of Moses or Christians are present in the Upper Room, Calvary, the Empty Tomb and at the Ascension’s Trinitarian Embrace when they receive Communion. Abuna Elia also observed that if we take the marriage to Keturah on literal face value we have the oddity of trivializing the conception of Isaac regarded as so marvelous for Abraham’s (and Sarah’s) advanced age… 'After… my husband is so old, shall I have with him the pleasures of marriage?' (Gen. 19). But the children accorded to Abraham almost casually and offhandedly are born many years after Isaac without any sense of wonder noted. Indeed, a certain Keturah may well have received Abraham after the disaster at Moriah and she may be the ancestor of whom these peoples are descendents so named in Genesis. But their inclusion into the paternity of Abraham owes to her or her descendents accepting the seed of his faith rather than his natural procreative powers. Genesis is a book of the Table of the Nations where apical ancestry is a crucial element… And by faith and faith’s acceptance Genesis previews for us how Abraham becomes a father of many nations. Kinship and national formation through ancestry re-interpretation is rather lost on the atomized citizenry of contemporary western folk. But Egyptians (Hamites) and Semites retain a taste for this kind of meditation." There is difficulty in reconciling the apical view of Keturah and Sarah with the kinship pattern revealed in Genesis in which the chiefs had two wives simultaneously. Genesis reveals a distinctive kinship pattern which, by its numerical symbolism, speaks of the Kingdom of God. Just as it took two wives in separate places to establish a kingdom, so the Kingdom of God is comprised of two groups: those who share the benefits of the Pleromic Blood before Christ's Incarnation and those who share those benefits in the dispensation of His appearing. The bridge between these two groups is the unified testimony of the three witnesses: the blood (represented by the Priest Simeon), the water (represented by the Baptizer John) and the Spirit (represented by the Prophetess Anna). Most midrashim are based on the teachings of the Tannaim and can therefore be dated to between 0 and 200 A.D. This means that the Rabbis were interpreting the Hebrew Bible at the same time that the early Church Fathers were expounding on the same Bible from a Christian perspective. The divergence of interpretation concerning messianic passages is explained by the polemic of those centuries. As western Bible commentators came to rely more on Jewish interpretation and became less acquainted with the Patristic writings, midrashic notions influenced Christian interpretation. This seems to be changing as more commentators return to the text for closer observation. Fr. Mark Gruber himself explored the difference between layers of midrash and close observation in his experiment involving an ostrich egg which hung between the ceiling oil lamps in the monastery chapel. He asked about the significance of the egg and was given several different interpretations. One monk said that the egg was there to remind monks to keep their spiritual eyes fixed on God. Another explained that the ostrich warms its egg by gazing on it and that this reminds us that God’s gaze is always on us. While sitting in the chapel one night, Fr. Gruber observed the hidden meaning of the egg: “I saw a scrawny desert rat crawling along a groove in the wall, creeping very slowly and with great stealth. It proceeded to slide down the wire till it came to the egg. However, when it tried to navigate the large smooth surface, it couldn’t get a grip. Its little claws had been so tightly closed around the wire that when it came to the egg, it couldn’t open them wide enough to hold onto it. So it slipped off the egg and fell to the ground. The rat seemed to be injured by the fall. It scurried away… So it turns out that the eggs actually have a practical purpose. They keep the rats away from the lamps, away from the oil reserve which they might otherwise try to drink, desert rats being omnivorous” (p. 171). This story illustrates the importance of observation of details in situ. In other words, we must conform our understanding to the fine details rather than ignore details that don't fit our interpretation. Fr. Gruber reports that Abuna Elia still lives and has achieved a very ripe age. He tells me that "these monks have been known to live a long time." The problem with insisting on literal use of Scripture is that the NT writers did not so use it. We are assured by the inspired writers that their use of OT Scripture to indicate Christ is precisely what the text meant. However, for many of those passages there is no way of finding those meanings in the text itself, taken in context, both literary and historical, nor, however, do those texts hold still as entire expressions of the contemporary events they were thought to illuminate. Even, I suspect, to the writer, they were quite mysterious. Only in the person of Jesus and by the leading of the Hoily Spirit does the fullness of the Scriptural message come to be heard. The use made by St. Paul and the other NT writers breaks every rule of "scientific" hermeneutics. Of course the literal meaning of Scripture matters intensely, but the literal meaning is not sufficient -- nor is the fanciful opinion of a single human writer, as in some midrashim, to be trusted. We approach Scripture with every tool we can garner, with our own logic and, yes, imagination, with all the discoveries of even the most secular of scientists and historians, and with awareness of what scholars in our own day are saying. Of course we do and must use all those tools, but, no matter how well we do that, we fail. With our eyes on Jesus, our hearts open to the Holy Spirit, and our ears straining to hear the Tradition, we become able to listen to the living Word, which is both written and beyond writing. As with St. Paul, as with many of the Fathers, and as with truly Catholic theologians to this day, the result will often (perhaps usually) look pretty much midrashic, but with a difference. It is not the midrash of wise rabbis, but the midrash of hameshiach v haruach, of the Christ and the Spirit, as consistently taught by Holy Church. I agree, Ed. You strike the proper balance between the evident and the veiled. We are invited to see and to draw near to discover, just as Moses saw the Burning Bush, recognized the mystery of it not being consumed, and drew closer to investigate this wonder.